Niagara Falls has been a destination for world explorers. They were formed more than 12,000 years ago. They are made up of 3 waterfalls: the American Falls, the Bridal Veil Falls and the Horseshoe Falls. Horseshoe Falls is the largest and Bridal Veil Falls are the smallest. They are located on the border of Ontario in Canada and New York State, USA. They were first discovered in 1678 by the French explorer Father Louis Hennepin. However it is not the tallest waterfall, Angel Falls in Venezuela is the highest waterfall in the world at 3230 feet in height. In some sections, the vertical height of Niagara Falls is more than 176 feet. Current erosion rate of Niagara Falls is approximately 1 foot per 10 years. The largest vertical drop is more than 50 meters. Annie Edson Taylor, a 63 year old school teacher was the first person to go over Niagara Falls in a barrel. Niagara Falls is the birthplace of commercial hydroelectric power. The world’s first commercial hydropower plant was constructed in 1895. Four Great Lakes: – Michigan, Erie, Huron and Lake Superior drain into the Niagara River before emptying into Lake Ontario. It is a myth that these falls freeze in the winter. All the three waterfalls together produce the highest flow rate of any waterfall on earth. Niagara Falls State Park stretches over 400 acres. Over 140 acres of that lie under water. Fish travel over these falls and approximately 90% of them survive because of their ability to flow with the water. Declan, Tobin. " 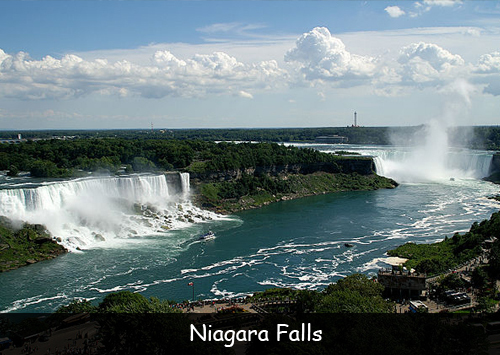 Fun Facts for Kids about Niagara Falls ." Easy Science for Kids, Apr 2019. Web. 18 Apr 2019. < https://easyscienceforkids.com/niagara-falls-facts/ >.